The second volume of Richard J. Evans’ trilogy of history books covering Nazi Germany, The Third Reich In Power, begins where the first left off, in 1933, with Hitler recently appointed Chancellor of Germany by the aging Hindenburg, and concludes in 1939, on the eve of the Second World War – a short period in which Hitler and his Nazis nonetheless managed to transform virtually every facet of German life. How did a fringe political party systematically dismantle one of Europe’s most promising democracies, subvert the rule of law, and reorient the entire economy towards war, in under a decade? Evans takes us through this brief period by focusing on various themes – “The Police State” and “The Mobilization of the Spirit,” “Prosperity and Plunder” and “Building The People’s Community” – culminating in the fateful decisions that made war inevitable: the annexation of Austria and western Czechoslovakia, and the invasion of Poland. His narrative is enriched by a wealth of detail unmatched by any comparable history of the period, from sources as various as the voluminous historical literature (“The Third Reich and the Unemployed,” for example, or Nazism and the Pastors) to the diaries and journals of some of the men and women who lived through the regime, with varying degrees of complicity. The result is a disturbing look into the inner workings of one of history’s most frightening regimes. Immediately upon ascending to power, Hitler set about subverting German democracy through a campaign of organized terror. Making full use of their two paramilitary groups, the Sturmabteilung (SA) and the Schutzstaffel (SS), the Nazis used violence and intimidation to bully known dissenters into silence. The major parties of opposition, the Social Democrats and the Communists, were early and specific targets, their leaders often rounded up and tortured, even killed. Those that managed to escape the Nazis often sought asylum in the Soviet Union, but in one of history’s bitter ironies, they were not safe there, either, for Stalin, in a characteristic fit of paranoia, had many of them jailed and killed as subversives. “Of the forty-four Communists who belonged to the Politburo of the German party between 1920 and 1933, more were killed in Stalin’s purges in Russia than died at the hands of the Gestapo and the Nazis in Germany,” Evans tells us. As the regime succeeded in killing or imprisoning its formal opposition, it extended its grasp to all areas of German society. The SS gradually subsumed the normal police forces, and the military – long a bastion of conservative opposition to Nazism – was made to swear a new oath of allegiance, not to the abstract nation state or its government, but to Hitler himself: “I swear by God this holy oath, that I will render unconditional obedience to the Leader of the German Reich and people, Adolf Hitler, the supreme commander of the armed forces, and as a brave solider am willingly prepared to risk my life for this oath at any time.” The Gestapo, a division of the SS, acted as the “secret police” of the regime, which, prior to the inauguration of the Final Solution, meant that they were tasked with eliminating dissent within Germany. Part of that mandate involved prosecuting citizens for “malicious slander,” defined so vaguely as to constitute almost any criticism of the regime, including jokes. More pernicious still, was in how these charges were laid: informants would denounce the supposed dissenters, and the Gestapo would subsequently investigate. It was a system ripe for abuse. Neighbours denounced noisy or unruly people living in the same building, office workers denounced people who were blocking their promotion, small businessmen denounced inconvenient competitors, friends or colleagues, who quarrelled sometimes took the final step of sending in a denunciation to the Gestapo. School or university students even on occasion denounced their teachers. Evans provides data that suggests that, in 1933 alone, “over 3,700” people were sentenced for “malicious gossip,” which sent “the majority of them to prison for an average of six months each.” Predictably, this resulted in a climate of fear gripping the citizenry, so pervasive and all-consuming that Evans cites the journals of many citizens who had recurring dreams of being stalked, chased, or imprisoned without charges. At the same time that he instituted policies that kept his citizenry in a state of permanent fear, Hitler sought to lend legitimacy to his policy decisions by initiating a number of plebiscites, ostensibly to “check in” with the German people. Of course, in practice the results were predetermined. “People who refused to vote, or threatened to vote ‘no,’ were beaten up, forced to parade through the streets with a placard round their neck with words such as ‘I am a traitor to the people,’ dragged round pubs to be shouted at and spat upon, or consigned unceremoniously to lunatic asylums.” Under these conditions, for example, the April, 1938 plebiscite on the subject of union with Austria received a remarkable 99% Yes vote. In “The Mobilization of the Spirit,” we are treated to a comprehensive overview of Nazi propaganda, and the genius of Joseph Goebbels in orchestrating the mass manipulation. The regime made great use of new technologies, particularly the cinema and the radio, not only for expanding its reach but also for dulling the citizenry to the oppressive conditions of life under totalitarianism. Goebbels was acutely aware that, to be effective, propaganda also had to be sparing, that an unceasing dose of ideology would dull its listeners if it didn’t actively turn them away. Entertainment, devoid of any political message, thus also had a role to play. “As Goebbels intended, there were plenty of entertainment films produced in Nazi Germany. Taking the categories prescribed by the Propaganda Ministry, fully 55 per cent of films shown in Germany in 1934 were comedies, 21 per cent dramas, 24 per cent political.” The radio, adopted by Hitler on his initial campaigns as a means of reaching the remotest corners of Germany, also took on special significance for the regime. The Nazis extended their grasp to the production of wireless sets as well, paying large subsidies to manufacturers to make and sell cheap radios known as People’s Receivers (Volksempfänger), available for 76 Reichsmarks or in a smaller version at only 35. This was no more than the average wage of a manual worker, and it was payable if required in instalments. One and a half million of these sets were already made in 1933. By 1934 over six million radio sets were in use in Germany, and by the middle of 1939 over 70 per cent of households in Germany owned a wireless, the highest percentage of any country in the world including the USA. Newspapers, too, played their role, and we can make some informed guesses about the success of Nazi propaganda by measuring the circulation of their own mouthpiece, the Racial Observer. “The paper’s circulation shot up from 116,000 in 1932 to 1,192,500 in 1941, the first German paper to sell more than a million copies a day.” By comparison, Julius Streicher’s infamous The Stormer, more lurid and more anti-Semitic than even the Racial Observer, was selling only 500,000 copies a day by 1937. It was of course not enough simply to tell people what they ought to read, hear or watch; the Nazis also took great pains to prevent the average German citizen from accessing outside information or dissenting perspectives. The People’s Receivers, for example, were deliberately designed with a limited range, so that foreign broadcasts could not easily be picked up. The Propaganda Ministry had final approval on all film productions, and regularly interfered with how German newspapers reported news, even international news. Book burning, that favourite pastime of thugs everywhere, took on an orgiastic quality under the regime; the Hitler Youth, for example, were frequently encouraged to round up seditious literature belonging to their parents or their schools and commit the offending pages to the flames. Soon libraries and bookshops were being raided, often in rapid succession, by agents of the Criminal Police, the Gestapo, the Interior Ministry, the courts, local authorities and the Supreme Censorship Authority for Dirty and Trashy Literature, based in Leipzig. The Hitler Youth, the brownshirts and the Nazi students’ organization were equally vigilant in rooting out books by Jews, pacifists, Marxists and other proscribed authors. […] Four thousand one hundred different printed works were banned by a total of forty different censorship bodies in 1934 alone. And for their part, Germany’s best writers showed an equal and opposite disdain, choosing to escape Germany while they still could. Bertolt Brecht, Arnold Zweig, Erich Maria Remarque, and Thomas and Heinrich Mann all fled, doing their best, while in exile, to warn the world of the Nazi menace. By July 1938, only 9,000 Jewish-owned shops were left in Germany out of an estimated 50,000 in existence in 1933. At the beginning of the Third Reich there had been about 100,000 Jewish-owned firms in Germany all told; by July 1938 about 70 per cent of these had been Aryanized or closed down. Regulations of various kinds put even the humblest Jewish private enterprises out of business. Most notorious of all was Hermann Göring, whose hunting lodge Carinhall was extended and refurbished at a cost of more than 15 million Reichsmarks in taxpayers’ money. The upkeep and administration of these palatial premises cost not far short of half a million marks, again paid for by the taxpayer; and beyond this, Göring also owned another hunting lodge in East Prussia, a villa in Berlin, a chalet on the Obersalzberg, a castle, Burg Veldenstein, and five further hunting lodges, not to mention a private train whose coaches accommodated ten automobiles and a working bakery, while Göring’s private quarters on the train, taking up two whole carriages, cost the state 1.32 million Reichsmarks in 1937, even before the extravagantly luxurious furnishings and fittings had been installed. Unsurprisingly, it was Göring who was the most notorious of the Nazi art thieves, quietly acquiring a private collection of art – stolen first from German and later French citizens – to surpass all but the best of modern museums; he used the paintings to furnish his various homes. 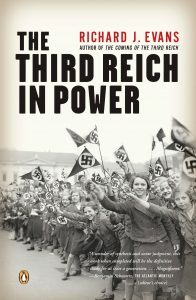 The Third Reich In Power is a monumental work of scholarly synthesis, and very likely the closest a modern reader can come to understanding the perils of living under Nazi power. Its narrative is discursive, and often loaded with details that would seem superfluous to all but the most curious of historians, and yet the end result is as compelling as it is horrifying.